Participating in "Street Fighter" series at S. H. Figuarts! In S. H. Figuarts, the monumental fighting games of world-class fighting game "Street Fighter" series start! The first line is Ryu � Chun-Li lineup from the early series. Based on the concept of "new (neo) � fighting elementary body", it is possible to reproduce various mortal works by combining a wide range of motion and a natural form! Put together in the reproduction of the technique by "New (neo) � fighting elementary body"! Based on the concept of "New (Neo) � Fighting Fighter body", adopted a movable gimmick for reproducing the technique. It is possible to reproduce the technique such as "Sayuri-fist" without destroying the natural form like human being. Special Moves Effects � Let's enjoy more views of the world with background sheets! 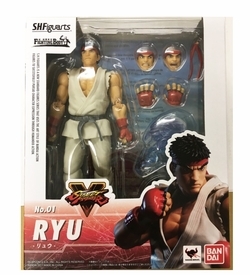 Ryu comes with an effect that imagined "wave fist". Production of glittering techniques that seem to be game characters can also be reproduced! Also included is a background sheet designed with stages during the game that will fight against each other! Enjoy the world of Street Fighter further! New (neo) � fighting elementary body ... ...】 Based on the concept of "fighting character's unique technique", pursuing a gimmick that is not captured by the conventional S. H. Figuarts format. It is a series that challenges the limits of "movable" "modeling" expression of about 1/12 size in order to maximize the charm of "fighting character" that fights with a variety of techniques polished using his own body.